everyone impacted by Parkinson’s disease live life to the fullest. Deliver branded, innovative, evidence-based, community-focused programs and services to those impacted by PD that considers ethnicity, geography, socioeconomic conditions, and gender at all trajectories of the disease continuum, and increase engagement with diverse populations. Advance research efforts through awareness campaigns, advocacy and collaboration, and increase research funding and number of grant applications, in order to financially support the most impactful clinicians and scientists. 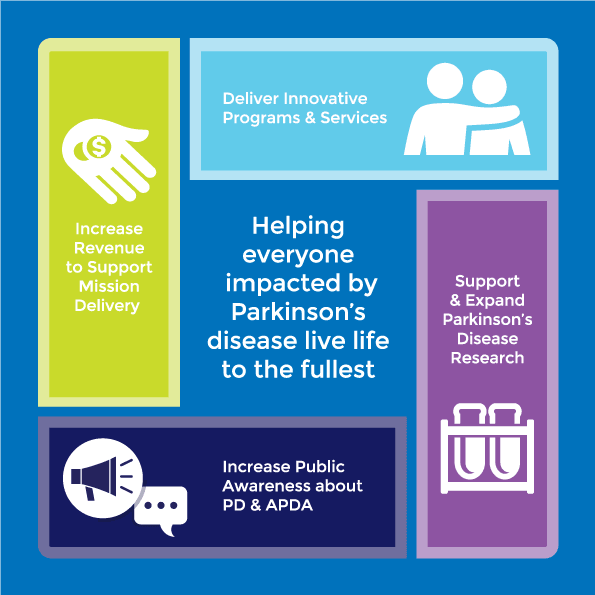 Execute awareness initiatives to educate the public about Parkinson’s disease as a major heath issue and promote APDA as the leading PD authority and subject matter expert. Expand existing fundraising campaigns and identify new income streams resulting in a diverse, sustainable revenue mix that supports APDA’s mission delivery.